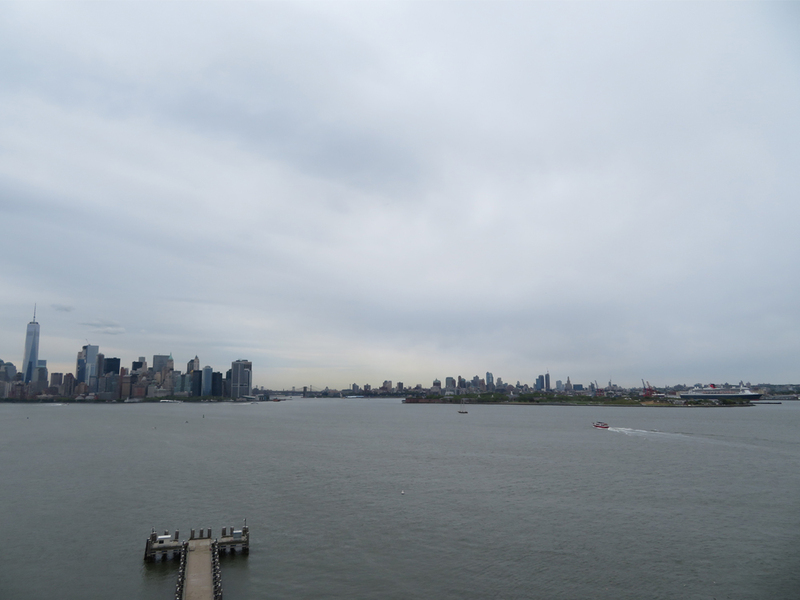 As we had checked out early from Queen Mary 2, we had most of the day to explore New York City. 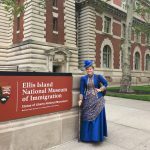 As I still had my dress on (and decided to keep it on for the day), the best fit seemed to be a visit of the Statue of Liberty and Ellis Island. 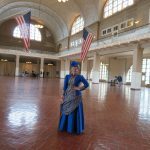 On the way there we had to switch trains at the new futuristic Oculus station.The ticket booth is located in the historic building of Castle Garden, the first immigration center to the US opened in 1855. The tickets for the Liberty Pedestal and crown were sold out, but regular access was still available. 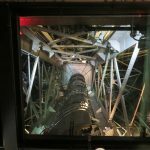 When we purchased the tickets, the venor looked at me, thought, and said: “Do you want to go up?”-“Sure”. Next thing we know is that we are holding two pedestral tickets in our hands to got up to the Statue. Awesome. 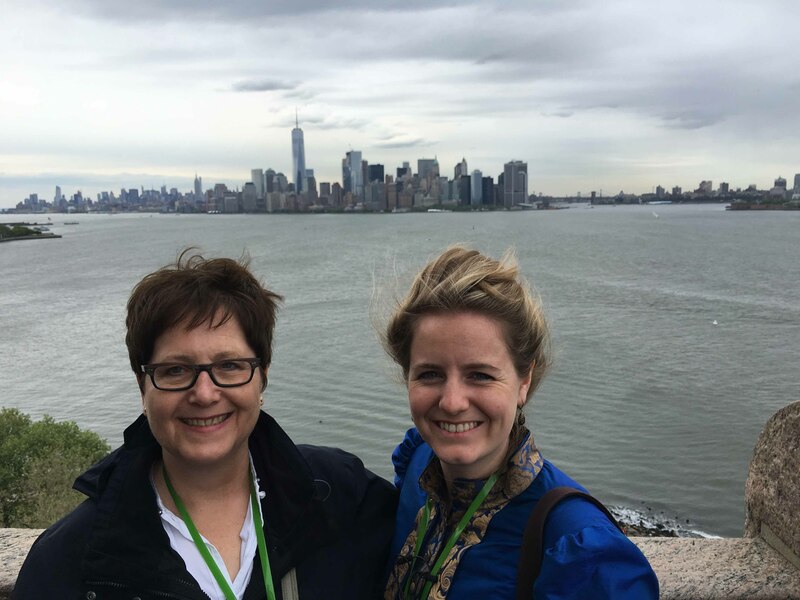 Then, the lovely security guard took my mother and me to the very front of all lines and we were able to board the very next ship to Liberty Island – that saved us alot of time! 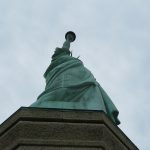 We got off at Liberty Island and after a short snack went up to the Statue – where we had another great view of Queen Mary 2 in the harbour and the Manhattan Skyline. 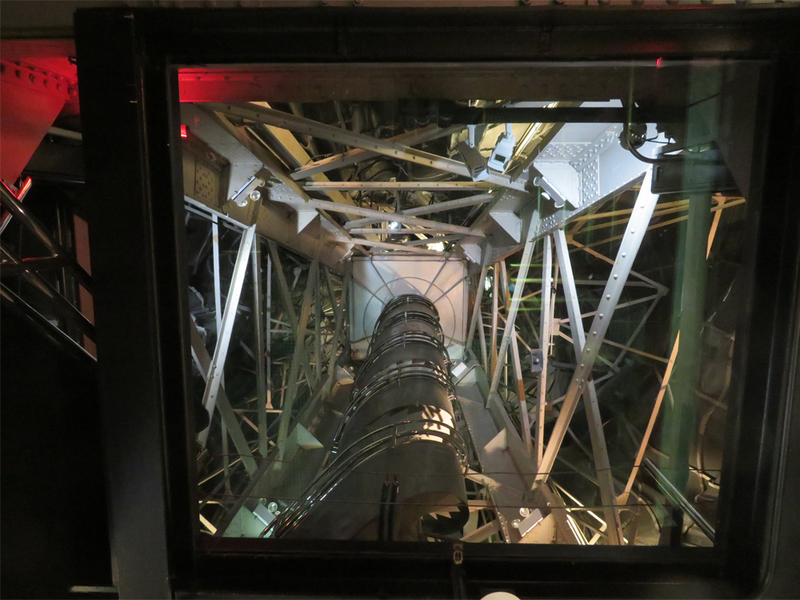 The nice aspect of this access to the Statue is that you can look inside the statue through a glass-window. 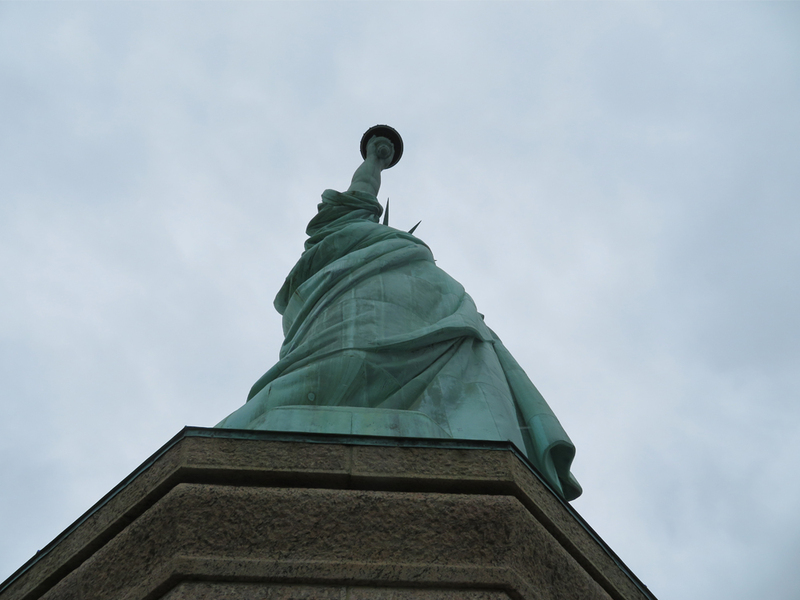 When wandering around the statue, I was asked by a ranger “Are you lost” – and she meant lost in time. Thee free audioguide is nice for some background information. 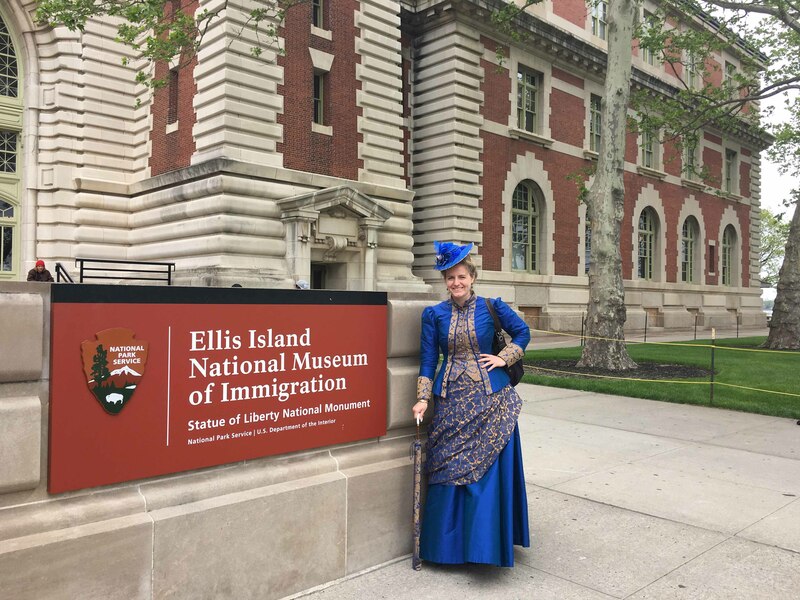 We boarded the ferry again to go to the next stop – Ellis Island – the Island of tears, where the fate of millions of immigrants was decided upon. After getting the free audio guide (German version available! 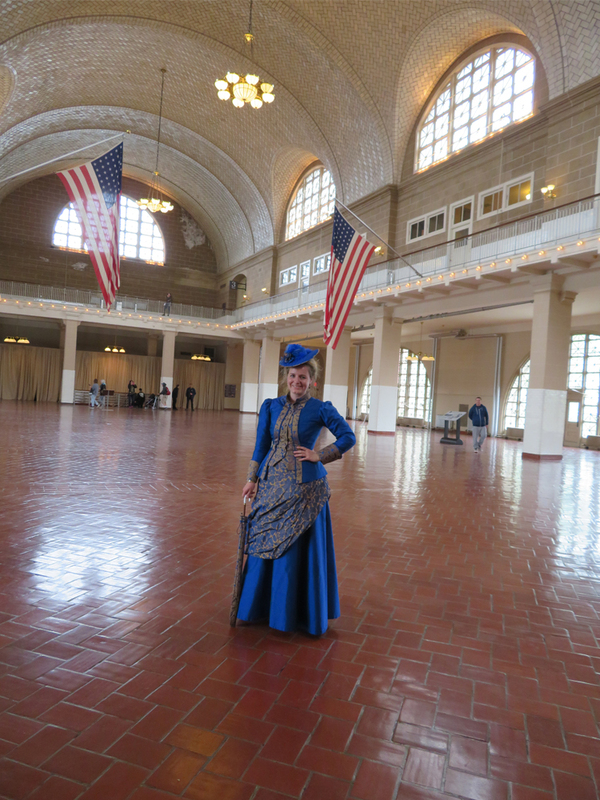 ), we wandered around the large entrance hall, the former luggage hall, and tried to listen to the introduction to the museum. That was merely impossible, because every few minutes, someone wanted to take a picture or selfie with me. The best moment was though when a german women came to me very excited and asked me “are you the woman from TV? I recognized your dress immediately” – nothing short of epic! The remaining visit of the museum was like the first minutes – every time I tried to listen to my audioguide, someone asked for a picture – or took it secretly. I was also asked several times if I worked at the museum. 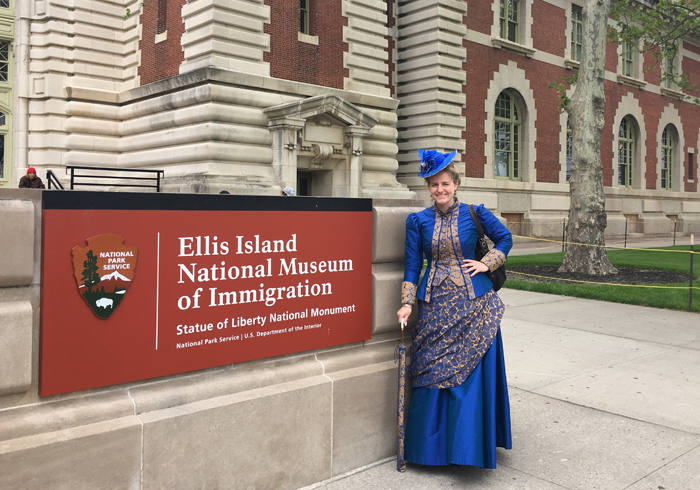 Nevertheless, I can say that the Ellis Island Immigration Museum is absolutely wonderful – we could have spend some more hours in there, but it closes already at 5 and the last ferry back to New York leaves at 5:15 pm. 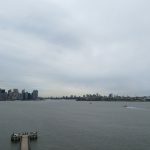 When we were back at the southern tip of Manhattan we were right in time to see Queen Mary 2 leaving the Brooklyn Terminals – a surprisingly highly emotional moment. This entry was posted in USA, Travel and tagged New York City / Newark, Museum, Sightseeing. Bookmark the permalink. 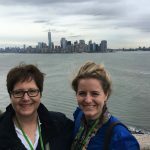 Habe Dich in der “Lokalzeit” gesehen, fand die Geschichte deines Urgroßvater spannend, lese interessiert deinen Blog! Demnächst Reise ich erstmal nach Wuppertal. Alles was mit Geschichte zu tun hat, was in die heutige Zeit hineinreicht, finde ich spannend. Auch das Kleid! Toll. vielen Dank! Viel Spaß in Wuppertal!